The upholstery and plastic are of better quality in all its variants. The rear seat is large and wide and offers ample comfort along with head restraints. The central console is presented with different offerings such as black paint, or cubicle painting depending over the version. The instrument panel is well organized along with a large glove box that can store lots of things. There are several other storage cubicles such as parcel shelf, door pockets, a large boot space of 510-litres, mobile holder, bottle holder, and a few others interesting holes where you may comfortably place your small belongings. Powering the saloon is the same1461cc, 1.5-litre dCi CRDi diesel engine that churns out a maximum power output of 65bhp at 4000rpm with a peak torque of 160Nm from 2000rpm. The oil burner is mated to a 5-speed manual transmission and sends power to the front wheels. The e-Verito is powered by 41bhp(30.5kW) motor that is capable of pushing the sedan to a top speed of 86kmph. 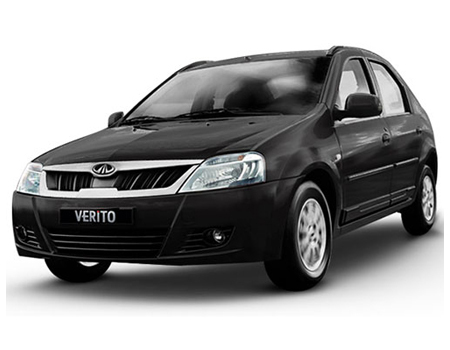 If you are not driving it fast, you can expect to harness the maximum out of the 100km range of the Verito. For short spins, you can quick charge the e-Verito in one hour 45 minutes to 80 per cent but the full range opens up only when you give it a full charge of eight hours 45 minutes.The 1461 cc Diesel – powered variant delivers a fuel economy of 19 kmpl in city and 21 kmpl on highways, while the Electric variant offers a mileage of 100 kmpl on urban roads and 102 kmpl and freeways, respectively. The driver airbag, anti-lock braking system (ABS) with electronic brake-force distribution (EBD) and electrical rear window child lock are available only on top-end model.The braking capabilities are good. It gets disc brakes up front and drum brakes in the rear, while ABS (Anti-lock braking system) with EBD (Electronic brake-force distribution) are offered on the top-variant only.